The 'Behind the Business: Lessons from successful Fingal businesses' event will feature accomplished entrepreneurs sharing their own experiences, insights and advice. The event is for professionals from all sectors in Fingal and is ideally suited to business owners, executives and managers in companies that are seeking that extra edge to really drive performance, growth and profitability. 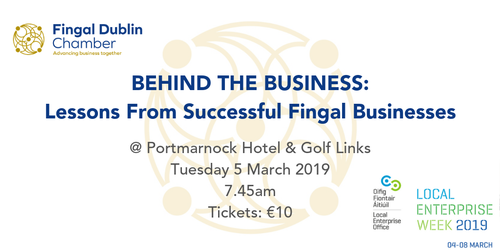 Fingal Dublin Chamber Chief Executive, Anthony Cooney will chair the panel discussion where leading Fingal business people will speak about the challenges and opportunities that exist for businesses who are trying to achieve success. There will be plenty of opportunities to ask questions, network with others and learn more about Fingal Dublin Chamber. Attendees will leave with a renewed sense of inspiration, energy and purpose. Oliver Dunne is an Irish head chef and restaurant owner. He is the owner of the Michelin starred restaurant Bon Appétit (Malahide), Cleaver East (Temple Bar), Beef & Lobster (Parliament St) and O'Connell's Restaurant (Donnybrook). Oliver is a regular on The Today Show on RTÉ and Virgin Media One's The Six O’Clock Show. He has also been a regular contributor to The Afternoon Show, Masterchef Ireland and The Restaurant. Grace Irvine is the Managing Director of McNally Joinery, a manufacturer of high-end bespoke doors, staircases and windows in Lusk, Co. Dublin. Grace has a B.A. in Business Studies from DCU and completed her ACA accountancy training contract at Grant Thornton, after which she progressed to Audit Manager at Royal Bank of Scotland. She has international experience in New York and Colorado across many industries including manufacturing. Tom Keogh is the Founder and Managing Director of Keoghs Crisps, an Irish snack food manufacturing and marketing company based on the Keogh Family farm in Oldtown, Co. Dublin. Keoghs has grown from an unknown startup to become one of Ireland’s most loved brands, exporting to 14 countries in just 7 years. Some of his proudest achievements to date include winning Enterprise Ireland’s ‘Best Start-up Business’, being named ‘Fingal Business Person of the Year’ and also being named the coveted ‘Irish Marketer of the Year’. - Please note limited places are available. Register early to avoid disappointment. ​Register Now.